I am sitting in Denizli Otogar (bus station) drinking free tea while waiting for an overnight bus back to Istanbul. I have had a day of relaxation, an evening of trials and first-hand experience of how gracious and considerate the Turkish people are. (This includes the five old men at this Doner Salonu who are fussing over me: bringing me extra water, salad and free tea; bringing the serviettes closer so I don’t have to reach across the table; and moving furniture so I can charge my laptop). As I said in my last post, yesterday was filled with Roman ruins and ancient history, the highlight of which was the ancient city of Ephesus. Again, I was overwhelmed by the layers of culture and religion packed into a society and how this was evident in the architecture and art of the once great portside city. Roman Pagan, Christian and Muslim monuments still stand side by side in Ephesus as a physical reminder of how differing faiths and associated hegemonies can choose to either share the world in peace or fight to a bloody, miserable death, or both. I spent the night in the town of Selcuk, a busy little market hub where everyone seemed to be getting married or related to someone in Australia. It was a balmy night and the streets were filled with tea-drinking, gossiping, backgammon-playing, happy Turks who were keen to have a chat. After taking a morning bus, I spent today sitting in the limestone baths of Pamukkale and admiring the gleaming white formations that cascade down from Hera Polis (the ancient city of Hera). With me were three Australian girls, who were backpacking Europe in their gap year. Alex, Aidi and Nicole proved to be fun, intelligent and familiar company, making an afternoon in the pools seem like a girly getaway. (Much needed after a few days of wandering alone and being in my own head). But the last few hours have been both comedic and stressful. I arrived at the Pamukkale tourist office fifteen minutes before my transfer to Denizli Otagar. One minute before scheduled departure, the travel agent, a worn, kind old man with braces on his pants, came to me and said, “I think you go to Istanbul tomorrow night instead”. “Ummm… no,” was all I could reply in my shock. “Yes, yes. Why not?” he said. “No no. Problem. No. You go tomorrow.” And then he was on the phone, walking away, like the matter was resolved. Now my flight to Syria is not until the 21st, giving me almost two days to get back to Istanbul, post home a few kilos of winter clothes (and shopping), print tickets, change money, buy shoes, see Topkapi Palace and visit Taksim on the Asian side of the city. A night in the tiny village of Pamukkale would probably bump the sights from my to-do list and mean I would be pushing for time to get everything else sorted before Syria. It was about ten minutes before the agent came back to me and said, “Okay, go now to Denizli, Izmir, Istanbul” and started pulling my pack from my back while rushing me towards a minivan packed with locals. “Wait. I need another ticket, I’ve already paid. How long will this take?” But before he could turn to reply, the minivan driver was yelling out the window and driving away. Another ten minutes and we were rushing towards another minivan. “Go now. Talk office at Denizli. You pay no more. All free. All free. Take ticket you have”. His eyes were so reassuring that I found myself climbing into the van and hoping that it all turned out okay. So there I was in 18 seater van with thirty locals, baby on my lap, no English-speakers and no idea where I was really heading. 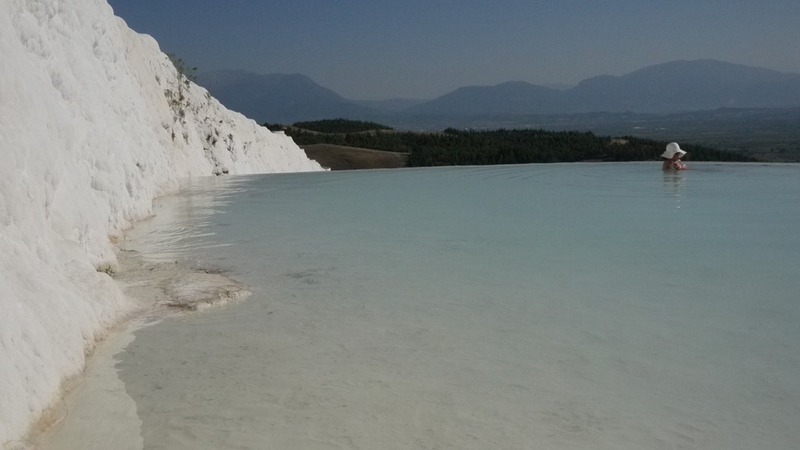 It was only a twenty minute drive from Pamukkale to Denizli. All the locals got off in suburban stops, leaving me alone with the driver, who pulled over the van and told me in broken English the otogar was ten minutes that way but there was a ‘problem’ and I should wait ‘no worries’. The wait was awkward. 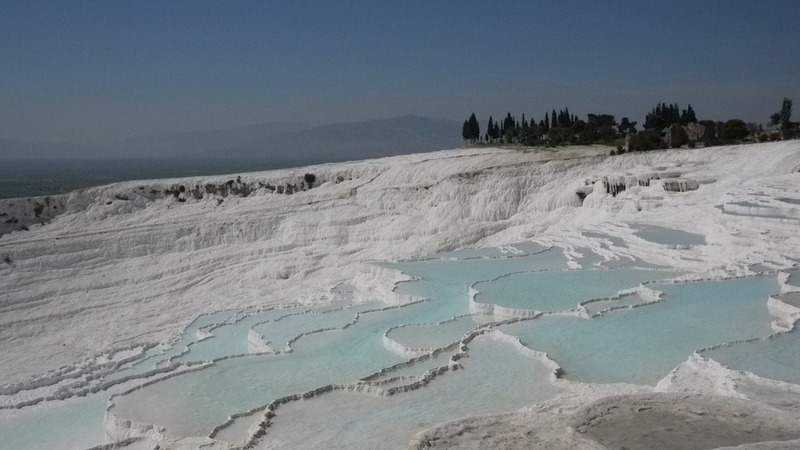 In an effort to regain control, I pulled out my Lonely Planet guidebook (a faithful friend when in a pickle) only to find Denizli is only mentioned in passing: “Pamukkale has no proper otogar; buses drop you at Denizli dolmus stop”. Then I tried to talk to the driver, but he only knew ten words in my language and I knew three in his. Then, in my post-dusk, no-idea-what’s-going-on state, I stated to feed my paranoia: was I being set up for some kind of kidnapping? Did I misunderstand the agent or diver? Would I be stranded on the side of the road in the suburbs of Denizli after dark? Of course, it was all okay. My driver flagged down the next minivan only fifteen minutes later, telling the new driver ‘she no pay’ and then u-turning his van and driving off. How curious. By 8pm I was standing in another travel office while the one flustered agent answered four phones in continuous rotation, served customers and printed tickets.“Don’t worry,” he told me, “I will help you. We will fix your problem”. And he did. I’m now booked on a 10.30pm bus to Istanbul that is scheduled to arrive sometime tomorrow. Let’s see what the rest of the night brings. This is so funny Nicole. These kind of things seem to happen all the time when you’re travelling. The way I see it is “If anything can happen, something will”. I do love the unexpected delights of travel. I think the trick is to keep your sense of humour and remember at the time that it will become one of the most memorable experiences of the trip. In the end, the bus ride was very similar to what you described, sans the vomitting. I sat next to a smelly old man who snored and was thoroughly over it by the time I arrived back in Istanbul. Thanks for reading by the way. It’s great to know my thoughts aren’t just bouning unnoticed around the ether. It’s also great to hear from people who have done it!